Law and the humanities, a subject likely to show up on my blog. However, this post has not as its first objective praising seminars on Law and Humanities, nor is it my goal to push anybody to start reading Martha Nussbaum’s Not for Profit: Why Democracy Needs the Humanities, though this is certainly a good idea. I hesitated myself when art came into my view for a post on legal history, but in fact a work of art was already a central element of my latest post. This time I want to write about art objects with legal power. Kings and emperors had their sceptres, often beautifully crafted, and now often on display in museums around the world. However, the art objects to be discussed here empower people. They express their claim to lands that in times beyond written memory belonged to them. 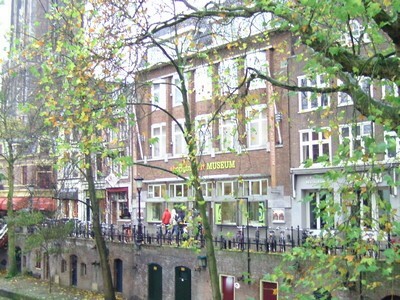 In 2001 the Aboriginal Art Museum Utrecht (AAMU) was founded, the only museum in Europe which specializes in works of aboriginal art. Apart from its own collection the AAMU houses an art gallery. The AAMU held in 2005 an exhibition titled Law and Land. 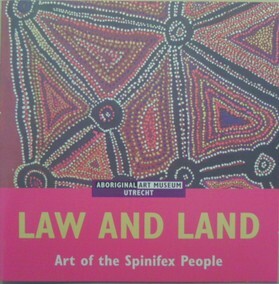 Art of the Spinifex People, which until then had been on tour through Australia. The Spinifex People who live in the Great Victoria Desert in Western Australia decided in the nineties of the last century to put forward a land claim. To support it they created in 1998 two Native Title Paintings, interestingly one by men and one by women. In 2001 the Western Australian Government accepted under the Spinifex Land Agreement the claim of the Spinifex People as decided by the Federal Court of Australia (FCA 1717; November 28, 2000). The area of land to which the Spinifex Land Agreement applies covers 55,000 square kilometers, almost twice the size of The Netherlands. The concept behind the native title paintings is well-known thanks to Bruce Chatwin’s novel The Songlines (1987), a masterful evocation of the Australian landscape, Aboriginal culture and its struggle to survive in modern Australia. The Aboriginal people described in songs kept secret to outsiders in sometimes minute detail the landscape of their country. Perhaps one should think of the title paintings more as evocations than of straightforward representations of geographical elements. The Spinifex Native Title Paintings lead in 2001 to the start of the Spinifex Foundation which promotes the arts. The Spinifex people had to leave the northern part of their land in the fifties because of British nuclear testing. This made it difficult for them to show continuous habitation following normal procedures for land claims. The 2000 agreement does not apply to the natural resources found in the region during the twentieth century, and thus for instance the rights of mining companies are not touched by it. The Spinifex Native Title Paintings form a landmark in Australia’s legal history equal to the first admission of aboriginal documents in 1963, the Yirkalla bark petitions. In the late eighteenth century the view came into existence that Australia was terra nullius, land belonging to nobody, and this doctrine held sway for over two centuries. Only in 1992 the Mabo Case put an end to this doctrine (HCA 23; 175 CRL 1 (June 3, 1992)) in which verdict the concept of native title was recognized. Much more can be said about the rights of the Aboriginal people and other indigenous Australian people. When I added some Australian addresses to my link collection of digital libraries it dawned upon me that some Australian things just happen to be in Utrecht, near at hand. The AAMU is worth a visit, although I could not help remembering immediately Chatwin’s description of Australian artists because of the presence of an art gallery. While musing about Chatwin’s view it would do more justice to say that people can be as versatile as the Australian Spinifex plant (Triodia pungens) which can be used in several ways. In order to survive in a desert, and more specific in the Nullarbor region, you simply have to be able to cope with different situations in different ways. Making traditional culture and land survive can call for unorthodox methods. Using art as an argument in law calls for fresh thinking, and this post is only meant as a glimpse of more. Anyway, today I liked to think about the desert on a particular rainy and stormy day. This entry was posted in Exhibitions, Landscapes and tagged Art, Australia, Human rights, Legal history, Museums, Nature on November 11, 2010 by rechtsgeschiedenis.